One night in London in the height of the blackout, a strange collection of individuals sit in a studio. An artist, his sister, a semi-famous actor dressed as a cardinal posing for him, and two intellectuals sitting in a corner playing chess. Well, in the middle of the blackout, you have to pass the time somehow. Needless to say, the evening is not going to pass uninterrupted. Soon, a soldier on leave bursts in, rapidly pursued by a Special Constable. The man who owns the studio who lived next door has been shot. As he was the uncle of the soldier and was found standing over the body, the soldier is promptly arrested, but Inspector Macdonald has other ideas. Seven years – technically, seven years and one day. That’s how long I’ve been doing the blog and it’s time for some changes… just kidding, it’s still the same old nonsense and the same sort of books (namely, anything that falls under the mystery category) and Lorac is a great example of what the blog has achieved for me. Even when I started the blog, I’d read most of Christie’s output, a fair chunk of Carr and I was aware of Sayers, Allingham and Marsh, even though none of them had ever particularly grabbed me. But through the blog, and, of course, so many other people’s blogs, more and more Golden Age writers have come onto my radar. John Rhode, Christianna Brand, Nicholas Blake, J J Connington… so many talented writers than now are becoming more and more available, thanks to the British Library, Dean Street Press, Coachwhip and many other companies. Lorac – or Carol Carnac to give her real name – is one of the next on the list from the British Library with Bats In The Belfry and Fire In The Thatch, books that sit either side of this one. Lorac’s not an easy author to find copies of, but I was lucky to stumble across this one. It’s a rather interesting one, sort of embracing the setting of the Blitz. The existence of a Special Constable, Macdonald’s sidekick bemoaning not being allowed to go to war, some conversations about “Mr ‘Itler”, but none of it really being necessary for the set up. It’s rather fun, if a little obvious to me, despite the murderer’s plan being utterly bat-guano crazy. The characters are fun, with the obvious exception of Macdonald, more grist to my theory that the forgotten authors are the ones who forgot to create an interesting sleuth. 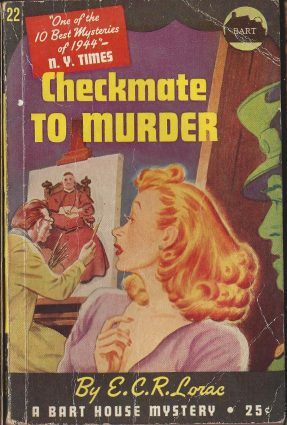 It’s nicely paced with a couple of well-placed clues, and, I believed, not considered to be one of Lorac’s finest works. If this is her on an off-day, I’m looking forward to reading her best. Hopefully this will be the British Library reprints (although admittedly their Miles Burton choice was a bit iffy – better than average, rather than the best). So, providing you can get hold of an affordable copy, this is Well Worth A Look. Previous Competition Time – Win John Rhode! It seems that ‘Murder of a Martinet’ and ‘Murder at the Mill-race’ are some of Lorac’s best work. Looks like this one is a middling title. To date I’ve only read ‘Murder by Matchlight’, which was somewhat underwhelming. My next foray into Lorac will probably be ‘Slippery Staircase’. Even though by the sounds of it, it is not perfect, the setting and crime setup do sound very intriguing. Is your edition the one shown in the picture? If so that’s a very lucky find. Not come across that imprint before. Too bad you don’t own that edition. The cover art is stellar. I’ve read just the two Loracs to date — Case in the Clinic and The Devil and the CID in their Ramble House incarnations — and while I agree that Macdonald is something of a dull fish I also agree that Lorac has an eye on the classic mystery that warrants further investigation. Those two novels take what should be fairly hoary and predictable situations and find uncommon ways to approach them…so I can forgive a dull protagonist in the face of subtle innovation. I have the other two Ramble House Loracs (Slippery Staircase and Black Beadle) on order, snapped up a cheap copy of Murder by Matchlight earlier this year, and have pre-ordered Bats in the Belfry from the BLCC collection, so it’s fair to say that she’s going to feature reasonably heavily in my reading over the next year. Second person to mention Slippery Staircase. Is that the same as the previously-reviewed-on-the-blog The Sixteenth Stair? Carol Carnac is not her real name. That’s just another pseudonym. Her real name is Edith Caroline Rivett. This was the first Lorac book I read and I didn’t think much of it. The only parts that interested me were the incidents involving the blackout and all the wartime talk. The villains are rather obvious. BATS IN THE BELFRY is better than this (not by much, IMO). For what it’s worth Lorac/Carnac books turn up on eBay all the time, most of them priced reasonably. That’s where I bought most of my copies of her books. Her later books published by the Doubleday Crime Club in the US are easy to find over here. The early ones I have to go hunting for. I’m lucky enough to own that edition, PD. It is lovely. And…like you, I’d heard several people note that this wasn’t one of her best, but I thoroughly enjoyed it when I read it last year.